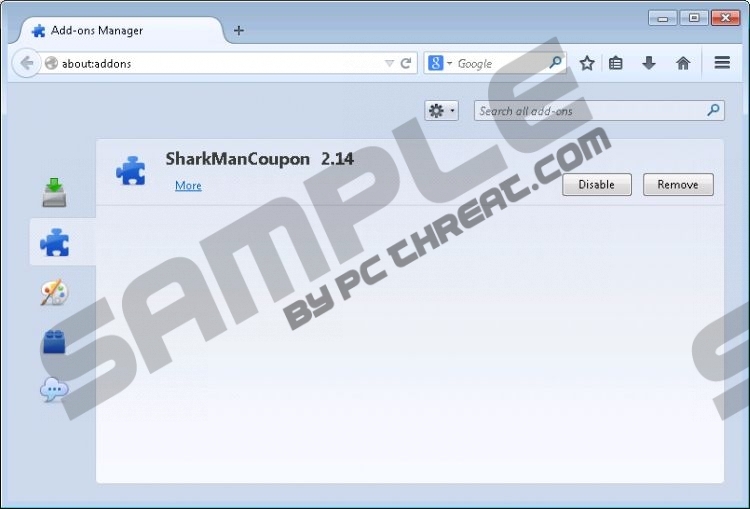 SharkManCoupon is a brand-new adware application that has been circulating around the web recently. Just like DealsFactor, CouponAddon, Deal4Me, TPerfectCoupon and quite a few others, SharkManCoupon is based on the JustPlugIt engine. Thus, it is not shocking that it is advertised as the mentioned applications – you are promised to be presented with numerous useful adverts, discount deals, and coupons that should save you a nice deal of cash while you are shopping online. Unfortunately, none of these presented ads are authentic so you will not save any money using SharkManCoupon. Therefore, there is no rational reason to keep this invasive adware program on your system. Remove SharkManCoupon without hesitation using the provided instructions below. The browser extensions will be installed to three most popular browsers on the market – Google Chrome, Internet Explorer, and Mozilla Firefox – as soon as SharkManCoupon enters you operating system. After successful installation of extensions, your browser will start displaying worthless and annoying third-party commercial adverts while you are browsing the web. These ads will make surfing the web a bothersome experience, to put it mildly. Unfortunately, SharkManCoupon is not only annoying but malicious as well. In some cases, adverts are implemented with redirect links to suspicious websites. So by clicking on an advert powered by SharkManCoupon you could land on a very dangerous website. It could be a fake web store crafted by cybercriminals in order to steal your sensitive data, or it could turn out to be a corrupted website running an arbitrary code execution. Both instances are extremely detrimental. It is quite obvious that you should not click on any adverts provided SharkManCoupon. The only way to stop these invasive and malicious activities is to remove SharkManCoupon as soon as possible. Mostly SharkManCoupon is distributed via bundled software. Vittalia, Amonetize, and InstallRex are the most popular installers used to spread SharkManCoupon. You have to realize that you can only trust official vendors’ websites for software downloads. Downloading software from any third-party download website is a huge risk. You should also install a reliable antimalware tool as it would warn you about any potentially detrimental downloads and dubious websites. The step-by-step removal guide provided below can be executed by users with no advanced computer knowledge. Removal using a professional malware detection and removal tool is advised as such tool will delete every bit of the infection that you might overlook; thus, ensuring that your system is clean and secure once again. Moreover, a licensed antimalware program will safeguard your PC against any other internet-based infection. Select SharkManCoupon and click Uninstall. Double-click SharkManCoupon to remove it. Remove SharkManCoupon from your system. Quick & tested solution for SharkManCoupon removal.